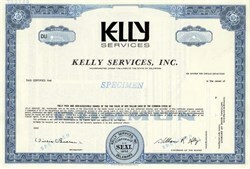 Beautifully engraved SPECIMEN certificate from Kelly Services, Inc. This historic document was printed by the Security-Colombian Banknote Company and has an ornate border around it. This item has the printed signatures of the Company's Chairman of the Board ( William Russell Kelly )and Secretary. In October 1946, with an office in Detroit, Michigan, and two employees, William Russell Kelly started a new company to meet the office and clerical needs of Detroit-area businesses. "Russell Kelly Office Service" provided calculating and inventory services, typing and copying. Most of this work was cyclical, so Mr. Kelly staffed his company with housewives and students -- people who had flexible schedules. By December of 1946, the Russell Kelly Office Service had 12 customers and $848 in sales. Today, Kelly Services, Inc. is a Fortune 500 staffing services company headquartered in Troy, Mich., offering human resources solutions that include temporary services, staff leasing, outsourcing, vendor on-site and full-time placement. With more than 2,400 company owned and operated offices in 26 countries, Kelly provides to its customers nearly 700,000 employees annually, with skills including office services, accounting, engineering, information technology, law, science, marketing, light industrial, education and home care. Sales in 2002 were $4.1 billion.